English weather is famous for its unpredictability and the climate in the city of Coventry is no different. The winters are cold, wet and at times frosty, and the spring weather can be crisp with frequent periods of clear blue skies. 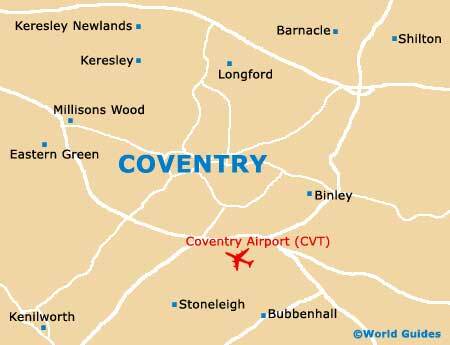 Predictably, Coventry's weather is best during the summer months, when there is plenty of sunshine for everyone. Coventry has a mean annual precipitation of 55 mm / 2.1 inches, with both August and December having a slightly higher than average rainfall of around 66 mm / 2.6 inches. Rainy weather tends to be more frequent during Coventry's winter months, with periods of heavy fog and drizzle at times. Summer rainfalls can be shorter and are often extremely heavy downpours, with the clouds soon clearing to reveal more favourable weather. Frosts are most likely in Coventry overnight in January and February, when the temperature stays close to freezing. The climate can feel even colder at this time of the year due to periods of strong, gusty breezes, which add a definite wind-chill factor. However, by the time that April has arrived, the weather is showing much more promise of summer sunshine, reaching 15°C / 59°F on occasion during April and even higher in May, during the sunniest spells. July and August, the traditional English summer holiday months, feature peaks of 25°C / 77°F and on still days, this can feel a little humid and muggy.